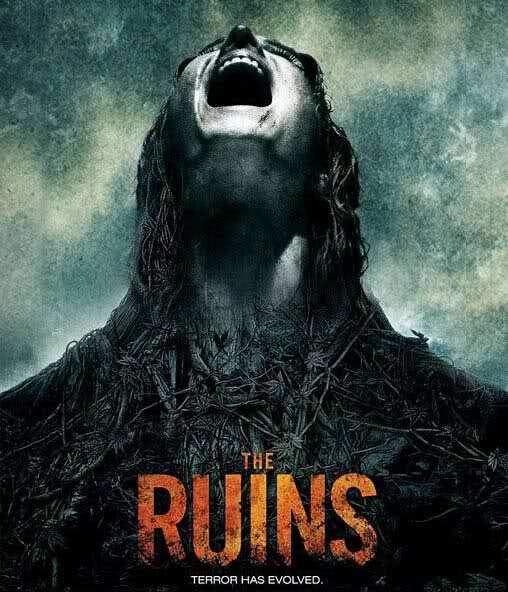 “The Ruins” is author Scott Smith’s second novel to be made into a feature film, with the first being Sam Raimi’s “A Simple Plan” in 1998. Whether a movie ever lives up to the book is always up for debate. Some of the things from the book are shifted around and changed but it does still keep its framework and essence. “The Ruins” is the story of four American college kids who are vacationing in Mexico when they decide to go with a few others to visit some ancient Mayan ruins. These ruins are covered with a green flowering plant that seems to be alive. Director Carter Smith and the filmmakers had the tough job of making these plants scary. With any horror movie, it’s only as scary as your killer, case and point Jason, Freddy, Michael Myers. So how do you make plants scary? Sound effects, CGI, and some pretty decent acting. As the group reaches the sacred ruins they are surrounded by a bunch of angry and armed locals who since they came in contact with the plants are not allowed to leave. The locals scream at them in a language they don’t understand. Just like in Eli Roth’s Hostel movies, the filmmakers really make the point that today’s young Americans that venture into other countries have this cocky air of invincibility. When things start to go wrong they basically think, somebody has to be looking for us, were Americans. And people wonder why some countries around the world hate us. They are supposed to be meeting there German friend Mathias’s brother, who is researching the ruins. His stuff is there but he isn’t. There is a pulley system to lower people down into the darkened abyss of the ruins and when they hear a cell phone ring, Mathias is convinced it’s his brothers. As he is lowered down the rope breaks, we then come upon what I’ve said before is my favorite disgusting injury, the compound fracture. This is where the real horror starts as they wake up the next morning to realize that the plant's vines are slithering into their wounds. The vines act like parasitic leeches drawn to blood. They move just under your skin like worms. Eeeewwww! Then the real blood and gore is put into motion. They cut of Mathias’s legs with nothing more than an oversized pocket knife. Another girl is obsessed with cutting out the vines from her body, making a horribly bloody mess of herself. Being in the deep jungle these civilized people slowly turn into barbaric savages who will do anything to stay alive, with little or no hope of rescue. They did tack on a typical Hollywood ending that will allow for a possible sequel. Overall this was a pretty decent movie, the gore effects were top notch, and I’ve got to say they did a pretty good job with the plants. I mean who isn’t afraid of homicidal parasites. It’s a pretty bleak movie, but hey its horror.